The secret sauce behind Vuze is peer-to-peer technology (often called P2P), and specifically, a protocol called bittorrent. So, what is P2P? What is bittorrent? How does it work and why should it matter to you? Until recently, it was virtually impossible to send large files, like video, over the Internet with any kind of efficiency. Nowadays, many video sites use a "one-to-many" model in which they deliver content to users from central computer servers. This approach is expensive and generally slow. That's why many video sites limit the length or size of the files. The result is often a grainy, low quality playback experience. Here is what a "one-to-many" system looks like. A Newer Way to Get Content - "Peer-to-peer"
In the late 1990s, all this began to change. The world witnessed the development of the first peer-to-peer file sharing models, in which the central server became essentially obsolete. This approach enabled individual computer users to send and receive files without the need for a centralized server. One "peer" literally delivered an entire content file to another "peer" - hence the name peer-to-peer. In the early years, peer-to-peer technologies were primarily used for transferring smaller text and music files due to the fact that the file transfer was constrained to the upload bandwidth constraint of an individual user transferring the file. In 2001, a new technical standard was developed - called bittorrent - that enabled transfer of very large files using a new peer-to-peer model. In this approach, each computer in the network - referred to as a "peer" or "seed" - has the ability to send or receive pieces of files to others. A user wanting to download a file (a "peer") can literally obtain small pieces of it from multiple computers ("seeds"). In fact, a computer that has only a portion of a file is able to send that portion to others who may need it, even though it does not yet have the whole file. Thus, a computer in the system can both receive pieces of the file from multiple other seeds, and send portions simultaneously. Because users simultaneously obtain pieces of the file from multiple sources, they can get the entire file much more quickly. 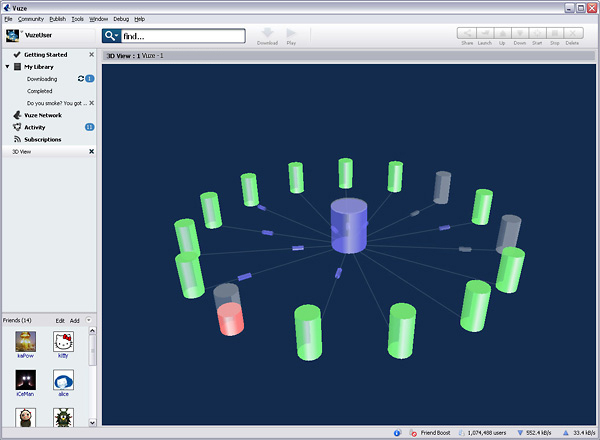 Put another way, rather than relying on the bandwidth capacity of a single set of central servers (one-to-many), or the bandwidth capacity of one other user (one-to-one), users are benefitting from the distributed computing capacity of all the seeds in the system (many-to-many) - collectively known as "the swarm" (visualized below). How cool is that? Vuze is proud to be a leading participant in the open source community, and has contributed significant advancements to the bittorrent movement over the years, including innovations in DHT, encryption, intelligent peer selection using Vivaldi, FriendBoost, and Reverse Subscriptions. More significantly, however, the Vuze team has developed and is working to continue to develop an intuitive product where users can easily experience the benefits of these innovations without requiring any understanding these underlying technologies. An entire etiquette and language has built up around peer-to-peer technology and the bittorrent protocol, so for those of you who are new to it, we thought we'd give you the low-down. Peer-to-peer technology relies on the community of users to work together and share. For the torrent community to work effectively and efficiently there are some "golden rules". These aren't hard and fast rules, but they're guidelines that people tend to follow to make sure that the swarm (and the community) stays healthy. "Seeding" lies at the heart of peer-to-peer technology. This is where you make content that you've already downloaded, or are in the process of downloading, available to other users. The efficiency of the technology depends on users like you seeding. In the bittorrent world, users who only download torrents and don't seed, are called "leeches." Of course, participation in seeding files means that you are making available some of your computer bandwidth to others. Some have said that this sharing of bandwidth may affect the performance of their computers. However, here at Vuze we take steps to help minimize any such effects. And, if you want to change the default settings and turn seeding off at any time, for all or part of your content it is easy to do so. Go here to find out more. Allow recently downloaded content to seed for as long as possible, or at least until your share ratio on the content reaches 0.8. Leave the Vuze client open as much as possible when your computer is turned on and online. The technology behind Vuze is magically cool. Ultimately, however, a community of people like you sharing their content is what makes it all work.